The attacker must be adaptable and creative. So it’s important for him to possess a large repertoire of manoeuvres and have high speed once the ball is at his feet. 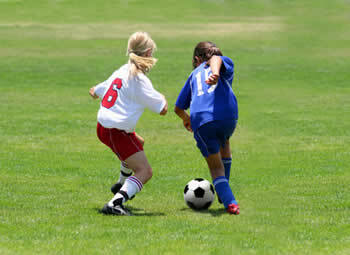 Which of the basic forms of dribbling outlined here are used depends on various factors. These include, in addition to the position of the attacker and defender, the speed of movement and the attacker’s intent. If the opponent is to be shaken off, this is mostly achieved through various manoeuvres. possess two or three manoeuvres. We have graphically portrayed some manoeuvres in the “Tricks" area. You should always be prepared in order to achieve an automatic motion sequence. The ball is driven in one direction. If the opponent follows the ball, interrupt the run and start off with the ball in the opposite direction. A pass is indicated with a glance. The pass doesn’t follow or occurs in another direction. Faster change in running speed.